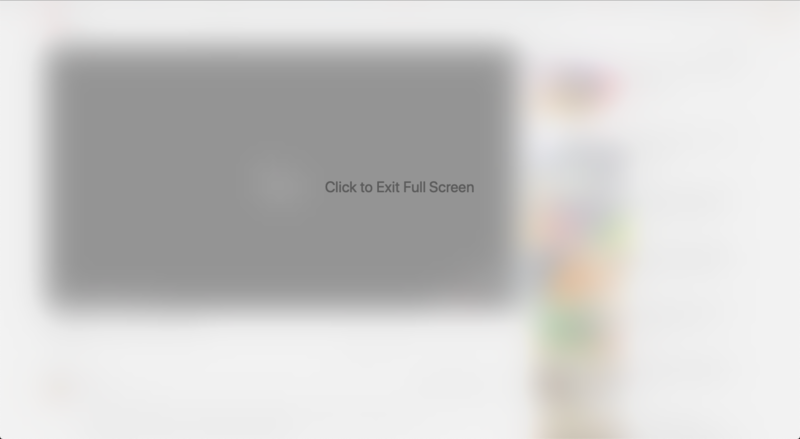 When watching a video on YouTube (or any other streaming service) – I use mainly Safari, sometimes Chrome, with the same result – when I switch to fullscreen, the video goes fullscreen in a new "Space" (virtual screen). I then have to click to exit full screen and double click again to get the full screen back (I'm sure there are other ways, with gestures and all, but it's just annoying). Is there a way to revert to a sensible (à la Windows, or previous OS X versions) on recent macOS versions? I know VLC can do it, so it is theoretically possible, but did Apple hide a system setting somewhere to change that behaviour? If not, is there an app that does it? Have you tried adjusting the settings related to this in System Preferences > Mission Control? The first checkbox there lets you disable automatic grouping of windows and there are other related options there too. You can also totally disable having multiple screens there. I'm not sure if you're using macOS mojave and this is no longer a feature. Also this is the one gesture that I use..dragging from one side of the trackpad to the other with 3 fingers. Not the answer you're looking for? Browse other questions tagged safari video spaces fullscreen youtube . How to access “Faster (fine)” and “Slower (fine)” playback controls on VLC for OS X? Else, what alternative?